The Parlour at Village Farm Barns in Elsham, near Brigg, Lincolnshire sleeps 2 people. 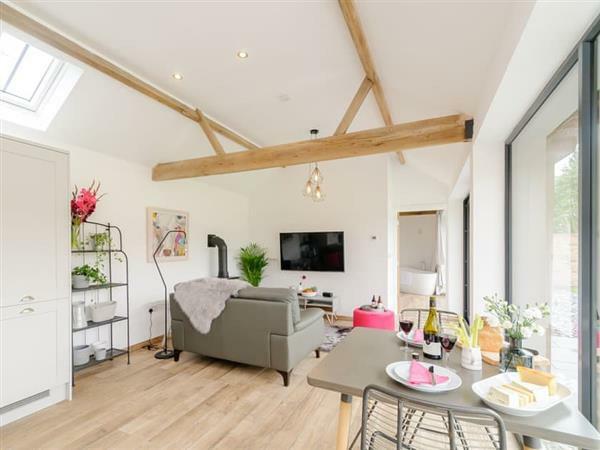 Village Farm Barns near Brigg is great for couples and families alike; these beautiful barn conversions (refs UK11123 [The Crew Yard] and UK11124), once used as a WWII airbase, have been sympathetically and lovingly converted by the owners’. Situated in a lovely area close to picturesque market towns and rolling countryside, they are ideal for a relaxing break, family holiday or romantic getaway. The Parlour is all on the ground floor. Bedroom: With king-size bed, Freeview TV, bath and en-suite with shower cubicle and toilet. Gas underfloor central heating, gas, electricity, bed linen, towels and Wi-Fi included. Welcome pack. External utility room with washing machine and tumble dryer (shared with other property on-site). Large enclosed garden with sitting-out area, garden furniture and barbecue. Tennis court (shared with other property on-site). Bike store. Private parking for 2 cars. No smoking. Please note: No children under 7 years old. There is an unfenced pond in the grounds, 220 yards away. Holidays at The Parlour, Village Farm Barns run from Friday to Friday. For a better idea of where Village Farm Barns - The Parlour is, you can see Village Farm Barns - The Parlour on the map below. Do you want to holiday near Village Farm Barns - The Parlour (UK11124), you can see other cottages within 25 miles of Village Farm Barns - The Parlour; have a look to find your perfect holiday location.